The traditional Asian forms of healing are based on the concept that the human body is filled with energy within it and around it. From this concept, Japan scientists dug deeper into the energies that propel the human body and their findings were astonishing. Our bodies emit light that is 1,000 less intense than the naked eye is sensitive to. Using extremely sensitive cameras capable of detecting single photons, the scientists placed the bare chested male participants in front of these cameras in a completely dark and light tight room. They stayed in the room for twenty minutes every three hours. 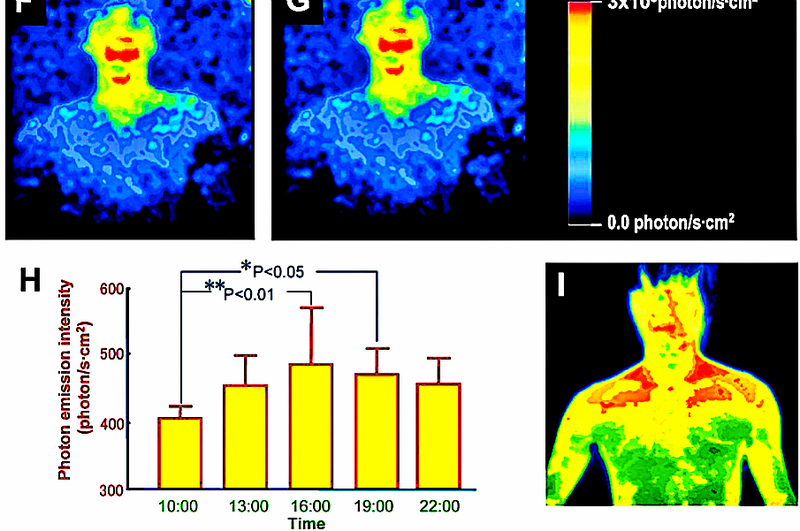 The researchers found that the participants’ bodies literally glow, with their faces having the most intense light emission. Maybe because it’s more tanned and the most exposed to sunlight. Moreover, the glow rose and fell during the course of the day, which suggested there’s a link between this light emission and the body clock’s metabolic rhythms fluctuations. Because of this linkage, there’s a great possibility that medical conditions will be detected using highly light sensitive cameras. In relation to healing, the Traditional Chinese Medicine has been using this energy of the body or “chi” as they call it throughout the centuries. This inspired some clinicians to approach healing based on physics and not on chemistry. The energy is found to circulate through the body along specific meridians. A manipulation of the points on the skin corresponding to a certain meridian could affect the energy circulation and the internal organs. One device used to measure the electrical skin resistance to gain information about the body’s chi flow is the electrodermal screening. This device could detect an imbalance in certain meridian points. To bring the energy into balance, non evasive ways, such as massage therapy, herbal medicine, and homeopathy are employed. Our body not only emits light but is also surrounded by an energy known as the “biophoton field.” Dr. Fritz Albert Popp proved the existence of the biophoton field in 1974. This biophoton field is likened to a computer that processes, stores, and retrieves information used to regulate our body’s biological processes. According to Dr. Popp, biophotons are laser like in nature and originate from our DNA. Every time the DNA contracts, it squeezes out one single biophoton, which is a light particle. The photon that carries all the information in the DNA relays the information to other biophotons surrounding the body. Additionally, the light field regulates the activity of the metabolic enzymes, causing the rising and falling of the light along with the metabolic rhythm. The transmission of nutrients in the form of light into the biophotons field is found to affect the body greatly. Similarly, environmental toxins like mercury can have devastating effects on the biophoton field. The sun gives out energy that makes all life forms to exist. Aside from the D vitamin that you can absorb from the sun’s light, you can also absorb the sun’s energy through the food that you eat. Dr. Johanna Budwig stated that live foods are rich in electrons that act as high powered electron donors and “solar resonance field” in the body to attract, store, and conduct the sun’s energy in your body. This means a substantial light energy stored in the body can empower your electromagnetic field and give you an optimum health. Consuming naturally grown raw foods is, therefore, the secret to having that glow within and around us.